Amateur rocketry now ranges from the model rockets you buy at your local hobby store to high power rockets available to qualified adults to advanced rockets, built by serious amateur rocketry groups, that are approaching the threshold of space. Model rocketry grew rapidly in the 1950's with the wave of interest in the new space age. It introduced rocketry while using safe, commercially available motors, and thus avoided the dangers of mixing ones own propellants. It is a popular hobby both for adults and young people. High power rocketry has grown in the past few years to become a booming hobby for adults with numerous clubs and regular rocket meets. These events must obtain a special clearance from the FAA for a given maximum altitude allowed for the day. Amateur rocketry, however, now extends even beyond high power to Advanced Rocketry. Numerous rocketry groups are attacking amateur high altitude records and are getting close to the official borderline of space, i.e. around 100km. Note that the participants in these efforts require advanced training and skills to deal with the dangers and complexities of building their own rocket solid rocket motors as well as liquid fuel engines and hybrids of solid and liquid propellents. ModelRocketSite.com |- model rocket news, information and resources. 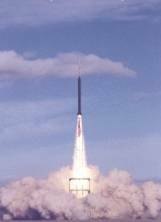 LevelThreeRocketry.com - sharing of rocketry images, videos, etc. Model rocketry is a great hobby for young and old (more than half the people flying model rockets are adults (ref)). You will learn the basics of rocketry and have a lot of fun at the same time. Model rockets are constructed of non-metallic materials, e.g. cardboard or plastic. One can purchase rocket frames or build ones own. However, only commercially available solid rocket motors should be used. This avoids the serious dangers involved in making ones own propellants. Motors are limited to G or lower (see the NAR Motor Power tables). Model rocketry in the U.S.A. must be carried out under the Model Rocket Safety Code. Rockets must comply with National Fire Protection Association Code 1122 to be classified as model rockets. Model rockets can be purchased at most hobby stores. Most of them allow new motors to be inserted for multiple use. Although model rockets don't reach the size and altitudes of the high power variety, they still can provide an impressive show with G powered rockets standing up to 2 meters. Furthermore, they can be quite elaborate and sophisticated with such enhancements as multiple stages, video camera payloads, radio telemetry, radio controlled glider return, etc. NAR - What is Model Rocketry? Illustrated 3D Model Rocket at Scaled Rockets - nice interactive display of f the parts and systems of a model rocket. Animation of a model rocket engine as it progresses through the phases of its burn. Model Rockets-Illustrated Subsystems and Parts - Scale Rockets - nice interactive diagram showing the components of a model rocket. Handbook of Model Rocketry, G. Harry Stine, 6th edition, John Wiley & Sons, 1994, ISBN:0-471-59361-3. While still part of consumer rocketry (i.e. certified motors are purchased from dealers rather than built at home), high power rocketry is an adults only hobby that requires training and certification. NAR - What is High Power Rocketry? The history of LDRS...captured here - The Original Rocket Dungeon - June.27.12 - Background to the development of the high power rocketry (HPR) sport and of the LDRS (Large and Dangerous Rocket Ships) series of rocketry events. Mark Canepa - The Space Show - June.28.09 - an interview with the author of the book, Modern High-Power Rocketry. NAR is the largest and oldest of the amateur rocketry associations was founded in 1957. Its provides numerous services to the amateur rocketry community including organizing sport events (launching for fun) and competitions (e.g. highest, longest flight, most realistic,etc), issue high-power certifications, sell liability insurance for rocket meets, and more. The web site provides lots rocket educational pages such as a nice introductory overview. The Technical Services section (NARTS) provides model rocket design plans, books, software, etc. They also have an extensive catalog with items for sell that include books, reports, paraphernalia, posters, scale data, rocket plans, software, etc. One of the largest organizations devoted to high-powered rocketry. Provides user certifications, sponsors rocketry meets such as the national LDRS event, publishes the Rockets Magazine, etc. IAR is an organization of non-professional rocketeers to promote all levels of rocketry from low-power to high-power. Founded in 1995. LUNAR - (Livermore Unit of the National Association of Rocketry) is a rocket club in Livermore California. NERO - Dutch Federation for rocket research. New South Wales Rocket Association - A very active club in Australia. Find a rocket club near you with these lists. Team America Rocketry Challenge - NAR & AIA sponsored a "national model rocket competition for U.S. high school and junior high school students." The organizations "challenge you to design, build, and fly a multi-stage model rocket carrying two raw eggs and an electronic altimeter to exactly 1500 feet, returning both eggs intact. The top five teams shared in a total prize pool of approximately $50,000 in savings bonds, and approximately $9,000 in cash awards will be divided among the sponsoring teachers' departments." Held annually since 2002. NASA MSFC Student Launch Initiative (SLI)- US students (grades 7-12) can particpage in the Student Launch Initiative by placing in the top 3 Level two teams at the Rockets for Schools competition held in Wisconsin or by placing in the top 18 teams at the Team America Rocketry Challenge, or TARC held in Virginia. NASA University Student Launch Initiative (USLI) - the college student version of the program. Sponsored by TheRocketMan.net and Christa McAuliffe / Challenger Education Center. 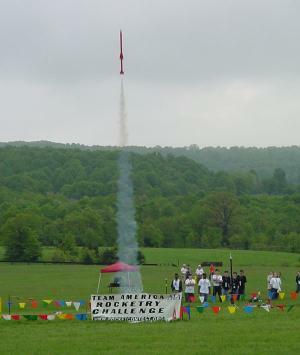 The AeroTech rocketry company is sponsoring contests at NAR and Tripoli-sanctioned rocket meets. Money prizes will be awarded to those who achieve the highest altitudes using its rockets in three different classes . Lander Challenge "requires a competing team to launch a sport rocket containing a simulated lander, to safely land the lander, and to deploy a rover. The rover must then be remotely navigated to a predetermined spot on the flying field." This site was "created by a group of individuals affectionately know as the SRN Volunteers for the sole purpose of attracting new rocketeers into our clubs and organizations." The site provides materials to "introduce you to every aspect of Sport, Experimental, and Amateur Rocketry. Inside you'll find easy to understand information for the beginner, information on local clubs and national organizations, a vast array of rocketry vendors, and links to other great rocketry web sites." This massive site provides resources on virtually every aspect of amateur rocketry. Has dozens of separate sections such as vendors, books, education links, etc. Devoted to amateur and experimental rocketry, T.J. Patterson has created this site with lots of links and resources. Virtually synonymous with model rocketry, Estes provides a nice site with a strong emphasis on education rather simply an online product catalog. Lots of rocketry resources ranging in areas from model rocketry to advanced high power amateur projects. Read reviews of rockets before you purchase them. This site encourages you to contribute your review of a rocket you enjoyed or was disappointed by. A web ring devoted to "model rocketry, experimental, amateur and highpower rocketry". This site provides "a comprehensive online resource covering the technical and historical aspects of small sustained thrust micro rocket motors for use in model airplanes and other craft." Believed to be the largest high-power scale model rocket ever to launch and safely return. It flew on April 25, 2009 from a site in Price, Maryland. The rocket weighs over 1,600 pounds, stands over 36 feet tall and will be powered by a massive array of nine engines, eight 13,000ns N-Class motors and one 77,000ns P-Class motor. The estimated peak altitude of the flight is 4,000 feet. extensive appendices provide details of all of the space-related models ever made and the many manufacturers and distributors who have supplied them "
All about spaceship designs in both sci-fi and actual aerospace. Great for modelers but also for anyone interested in the history of spaceship concepts. Created for the adult enthusiast, each issueof High Power Rocketry comes with great model designs and instructionals, reviews of the latest equipment and technology and profiles of the people who share in your love of rocketry.